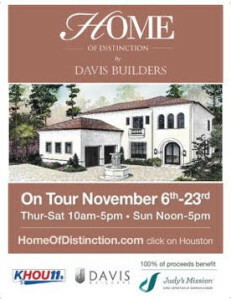 Judy’s Mission partnered with Davis Builders to present, Home of Distinction. Dozens of design trends and building products were on display in this magnificent 6,600 square foot home located in the heart of the Galleria/Tanglewood area. 100% of ticket sales benefit Judy’s Mission. A preview party took place the night before the tour began.